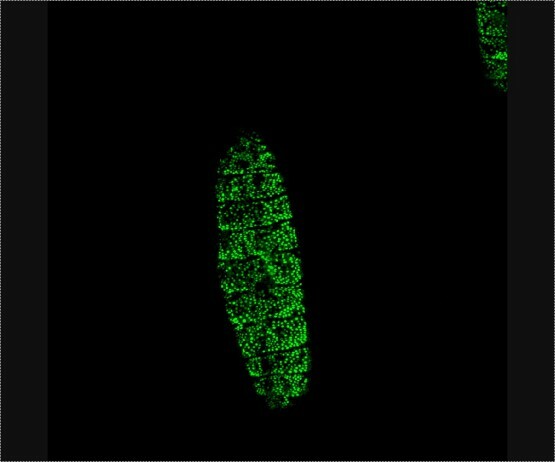 Their discovery, detailed this week in the open-access journal PLOS ONE, was made in the laboratory fruit fly Drosophila. But the biologists say many of the same genes that regulate biological processes in the hard exoskeleton, or cuticle, of Drosophila also control processes in human skin. That makes them attractive candidates for new kinds of wound-healing drugs or other compounds that could be used to treat skin ailments. By puncturing the cuticle and epidermis of fruit fly embryos in their experiments, the researchers examined 84 genes that are turned on and 78 that are turned off as the fly embryo responds to healing. From these 162 genes, they identified eight genes that are expressed at either very low levels or not at all in most cells during development, but are activated near the puncture wounds. The researchers were surprised to discover that an immune response begins as soon as the flies’ cuticles and epidermis were punctured, releasing antimicrobial peptides and other compounds that prepare the embryo should bacteria or fungi enter the site of injury. The key to their technique was the use of trypsin, a member of a family of enzymes called serine proteases, which activates genes involved in wound healing. The next step is to see if these genes play a comparable role in humans. “I think one amazing application of our studies may be to build a better bandage—containing compounds to promote would healing,” said Juarez, a former postdoctoral fellow in McGinnis’s lab who is now an assistant medical professor at the City College of New York. Funding for the study was provided by the National Institutes of Health (GM077197 and HD28315), a Developmental Biology of Neural Diseases Training grant, the Ray Thomas Edwards Fellowship and the family of Herbert Stern.